The king is peacefully sleeping in his bed, but he doesn't know that this night will be his last night. The assassin hides in the dark. Lead him to the king's bed and strike the dagger in his flesh. You are the king's murder and you have to make sure, that the king will be dead till the dawn. He is peacefully sleeping in his bed, but there are guards and a security system, that won't let you pass easily. Choose the best time to pass through the guarded places and interact with various objects to open or disable the gates. 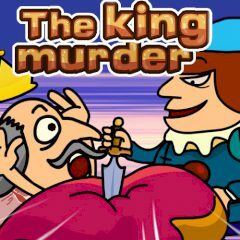 Have fun, king's murder!